Number 13: I’m feeling pretty lucky right now! In reality, Fox explains that he can eat no more than 1 entire pizza pie and drink no more than 1 gallon of milk. This is purely comic exaggeration. This week Dragon is moving into a deeper realm. There’s a couple weeks’ worth of story arc outlined as Dragon begins to ask the deep, penetrating questions. These are the thoughts that have, in the past, held me back and prevented me from devoting as much time to visual arts, or from feeling as if my ability translated into anything worthy of the hours devoted to it. In conclusion, look at Fox’s mouth in the last panel! Look at those tiny little teeth! Tee hee. This page is best viewed at 125% or greater magnification, so zoom in if you can’t see. If you enjoy the adventures in Dragon’s cave, please like and share these links. 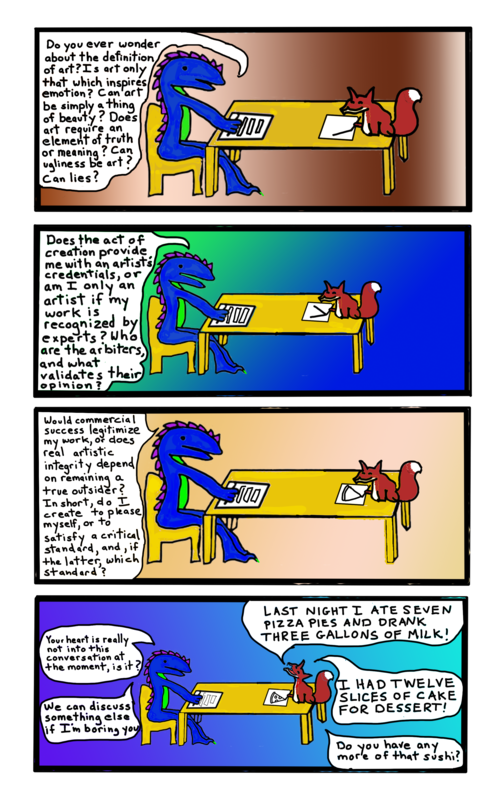 This entry was posted in art, Comics, Dragons, drawing and tagged art, comics, critics, dragon, drawing, eating, food, fox, happiness, meaning, philosophical questions, pizza, questions on September 15, 2014 by littledragonblue.